Floriday.co.uk - Amazing Adventures of Spider-Man Now Open! - Florida Holidays, Disney, Universal, SeaWorld - The best of Orlando! Today, Marvel Super Heroes & dozens of Spider-Man fans gathered to celebrate the grand re-opening of The Amazing Adventures of Spider-Man! The day started off bad as Dr. Doom and Green Goblin started harassing reporters and kids, but they were quickly chased away by Spider-Man and some of his superhero friends. 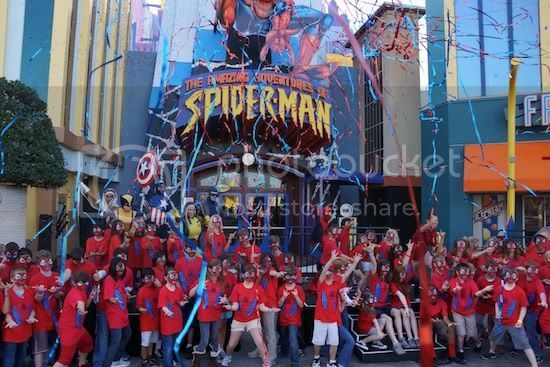 Although the storyline for the ride remains the same, the award-winning attraction now features stunning all-new enhancements, including digital high-definition ride animation, a new highly-sophisticated Infitec 3-D projection system, a rockin’ new music score and all-new 3-D “Spider-Vision” glasses. While the animation has been re-output in HD, they didn’t simply output the same film you’re used to. The characters have some new looks, and the details are amazing. You can see threads on Spider-Man’s suit. You can see rats scurrying in the background. But the animators have added a few new things too. You’ll likely notice things you hadn’t before, whether it’s because the screen is so sharp, or because they simply weren’t there before. One scene now has your scoop vehicle bumping knocking Green Goblin off the top of a building and you can see him falling all the way down in the background. In fact Universal says hundreds of new details and effects have been added including a cameo appearance from Spider-Man co-creator Stan Lee. Who’s ready to ride? We know we are!